Husband and I recently took a genealogical road trip to Illinois. First Stop – Judy Russell. The Legal Genealogist spoke at the Chicago Genealogical Society meeting in Arlington Heights. That was a day well spent. Next up – locate the final resting place of two of my Tolf ancestors. You’d think I’d have planned ahead for this part of the trip, but it turned into a kinda last minute “Will we have time? I dunno. Let’s bring the info along just in case.” situation. 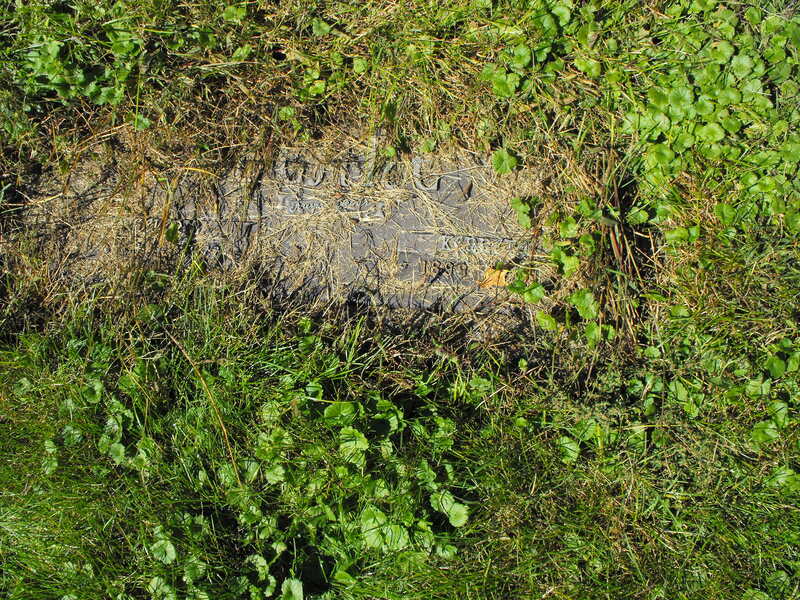 Despite that, miraculously, we found headstones in three different cemeteries for EIGHT leaves on my family tree. Yippee!! Thankfully each of those headstones were in pretty good shape. Because as I mentioned earlier, I forgot to bring the cemetery kit. Every time we visit a cemetery, Husband and I photograph headstones for Find A Grave. When we stumble upon headstones that are sinking into the ground, we do a little landscaping work to make them visible again. The headstone pictured above is at Lincoln Memorial Cemetery in Oswego Illinois. It’s been on my mind since I saw it , so I’d like to tend to it as soon as possible. Thankfully there’s another road trip on the horizon. And the cemetery kit is already packed. Fantastic! I never thought of a little ladder to get a better shot. I spend too much time trying to get my shadow out of the photo…I bet the ladder would make a huge difference!! Good to hear you took a trip to Illinois – I was in the state over Labor Day attending my 45 High School Reunion and had a great time. The weather was beautiful! Going to the old cemeteries is such a treat except when you find ones that no one has taken care of in years and then it is sad to see. Thanks – we really enjoyed ourselves. How nice that you were able to see the old HS crowd and that the weather added to a nice trip. Saving this so I know what to pack. I have not done much cemetery research – I have visited cemeteries to confirm for myself the information I may have first found on a Find-a-Grave memorial that did not include a picture of the tombstone. I would love to see you do a post on what and how you use the items (particularly the tinfoil) on your list; your process on cleaning and photographing the tombstone, etc. This is a subject that I am most interested in learning more about. Thank you for sharing your cemetery kit. Glad you found the list helpful! I love cemeteries, there is so much history hidden among the stones. I would be delighted to share information about how we use the items in our cemetery kit. I’ll take photos and share our process as soon as we return from the next road trip. Stay tuned!